When Caitlin Mahony, an assistant conservator at New York’s Metropolitan Museum of Art, first examined a wooden Yup’ik mask last spring, she was at a loss for how to proceed with its treatment. Created around 1900 at the behest of a shaman for use in a ritual dance in Alaska, it was perforated on the sides with holes into which appendages were inserted. Some of these were broken, missing or possibly in the wrong position, which made the mask difficult to understand. Mahony decided to turn to an expert. Relying on her network of conservation colleagues, she contacted Chuna McIntyre, a master storyteller and dancer born in southwestern Alaska who travels widely, performing in traditional costume as an ambassador for central Yup’ik culture. He agreed to fly to New York from California to help decipher the mask’s original configuration. “I wanted to make sure before I stabilised things that the appendages were going to fit in the correct locations,” Mahony says. 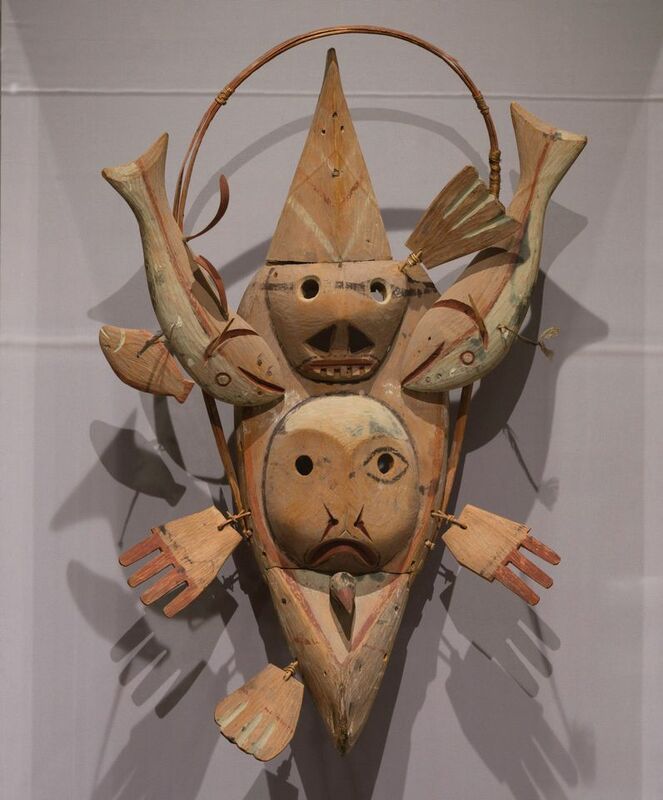 The mask, donated to the Met last year, is now on view at the museum along with 115 other objects dating from the second to the early 20th century in Art in Native America: The Charles and Valerie Diker Collection (until 6 October 2019). A mix of painting, sculpture, drawings, regalia and baskets, most of which have been given or promised to the museum by the New York couple, it aims to acquaint viewers with the customs and daily life of more than 50 indigenous cultures. Carved from driftwood and measuring nearly 3ft in height, the mask depicts a kayak pierced by a seal and studded with a skull, a fish, a bird’s head, hands, flippers and feathers. Too large to wear, it would have been suspended from the ceiling in a ceremonial dwelling. A Yup’ik dancer would approach the mask from the rear and bite on a protrusion to set it in motion. As Mahony had suspected, several elements were in the wrong locations. Relying on his Yup'ik heritage, McIntyre guided her on their placement. “There’s an ancient blueprint that we follow,” says the dancer, reached by phone at his home in the San Francisco area. Two comma-shaped red pieces depicting spurts of blood were moved from the skull to the gills of one of the two salmon framing the top of the mask. A hoop on the mask was in the wrong location, and previous repairs on it were failing, so Mahony adjusted the position and stabilised it. The two flippers towards the bottom of the front of the mask were not originally a pair but a single front and a single back flipper, so one was moved. McIntyre also noticed that two original flippers were missing. When the mask was created around 1900, shamans were instrumental in their design, drawing on dreams and visions as mediators between the people and the spirit world. Yet according to McIntyre, the mask’s iconography is intuitive for any Yup’ik speaker. The animals depicted—the seal, the two salmon, a flounder and the bird—“were in concert together, and we were part of that concert”, he says. “Without them we could not have survived. When we do our masks, and we make these images, it is in thanks, in supplication, in reverence to the natural world.” The skull represents life and death, he says, and the hoop is the “weight of the universe, tying everything together”. He says that much of his own knowledge of Yup’ik culture was imparted by his grandmother, who passed along traditional stories, dances and songs. “She was my tether to the ancient world,” he says. It’s not the first time the Met conservation department has consulted indigenous people on a project, but this was a “a deeper dive”, says Lisa Pilosi, the conservator in charge of the museum’s Department of Objects Conservation. In an unusual collaboration, the museum is considering appending two flippers that are being created by McIntyre to replace the missing ones, Mahony says. “It would encourage our viewers to understand the piece more fully,” she adds, while also “making a connection with the living community” of Yup’ik people." Pilosi emphasises that such an intervention would be noted on an exhibition label. McIntyre, meanwhile, continues his work as a Yup’ik performer and recently co-curated Yua: Henri Matisse and the Inner Arctic Spirit, a show incorporating Yup’ik masks at the Heard Museum in Phoenix.